What can I say, this is some really cool stuff. Jazz-progressive freakout music from Japan, but much more controlled than, say, Acid Mothers Temple. The band is lead by sax player M. Fukushima. This guy can really play soulful but then he can really wail. He is backed by N. Uchida on Bass and M. Sawada on Drums. Some of the best tracks feature guest guitar and keyboard players. It increases the dynamics of these players. The biography recommends this to fans of the Soft Machine and I would totally agree. Sometimes the music reaches out towards space like on parts of "Underdog’s Blues". "Afro Zone" begins with some great bass lines and dual sax and trombone and some wah guitar as a quite cool jam ensues! The CD closes with the long (12 minutes) "DADA". This is a more standard jazz fusion type thing but it has its interesting twists and turns. Fantastic, that is all I can say. I heard the CD ten times now and it is still fresh and exciting! For more information you can visit the Morsof web site at: http://www5.plala.or.jp/killingfloor/mm_sm.html. 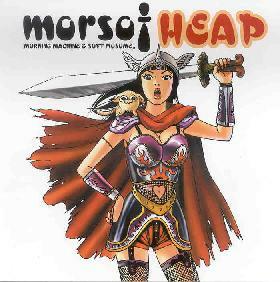 Heap is distributed by Musea Records. You can visit their web site at: http://www.musearecords.com.